Persistent dryness, scratchiness and a burning sensation on your eyes are common symptoms of dry eye syndrome. 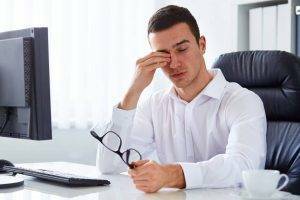 These symptoms alone may be enough for your Bardstown eye doctor to diagnose dry eye syndrome. Sometimes, he or she may want to measure the amount of tears in your eyes. A thin strip of filter paper placed at the edge of the eye, called a Schirmer test, is one way of measuring this. Your eyecare practitioner may recommend artificial tears, which are lubricating eye drops that may alleviate the dry, scratchy feeling and foreign body sensation of dry eye. Prescription eye drops for dry eye go one step further: they help increase your tear production. In some cases, your optometrist in Bardstown may also prescribe a steroid for more immediate short-term relief. Check the label, but better yet, check with our Bardstown eye care expert before buying any over-the-counter eye drops. Your eye doctor will know which formulas are effective and long-lasting and which are not, as well as which eye drops will work with your contact lenses. Presbyopia care is also available at our optometry practice in Bardstown, KY. 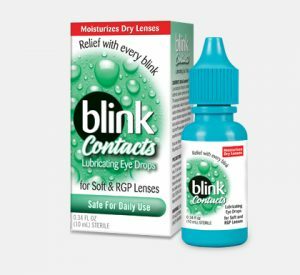 This lipid-enhanced lubricant eye drop is clinically proven to treat the signs and symptoms of Dry Eye. 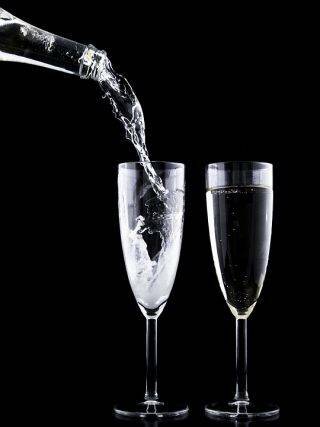 Mega-3 does not require shaking prior to use, unlike Retaine® MGD. 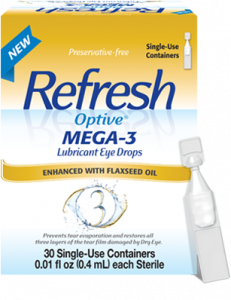 REFRESH OPTIVE® Mega-3 Preservative-Free Lubricant Eye Drops come in sterile, single-use vials you can take with you. The most common side effects of Xiidra include eye irritation, discomfort or blurred vision when the drops are applied to the eyes and an unusual taste sensation. Tell your doctor if you have any side effects that bother you. These are not all of the possible side effects of Xiidra. Have a bad aim? It’s ok! The most common side effects of Xiidra include eye irritation, discomfort or blurred vision when the drops are applied to the eyes and an unusual taste sensation. RESTASIS® and RESTASIS MultiDose™ Ophthalmic Emulsion help increase your eyes’ natural ability to produce tears, which may be reduced by inflammation due to Chronic Dry Eye. RESTASIS® and RESTASIS MultiDose™ did not increase tear production in patients using anti-inflammatory eye drops or tear duct plugs. Punctual plugs are biocompatible devices that can be inserted into the tear ducts to prevent drainage. This will increase moisture in the eyes and help prevent dry eyes. They are also called punctum plugs, lacrimal plugs or occluders, and they are no bigger than a grain of rice. These plugs are prescribed when eye drops have failed to work. There are two types of plugs, semi-permanent and dissolvable. Semi-permanent plugs are made of silicone, a long lasting material, and dissolvable ones are made of collagen, which the body will eventually absorb. Dissolvable ones will be used after surgery to prevent dry eye or used to determine if a more permanent option is right for you. The innovative Cold Therapy Eye Compress safely delivers timed-released cold treatment to reduce inflammation and swelling caused by surgery, allergies and Dry Eye Disease. The eye compress is soft and flexible and may be applied directly to the skin without a cover. This gel-free product is condensation-free and double sealed for longevity. Wash your mask and store it for repeated use. Problems with contact lenses and lens care products could result in serious injury to the eye. It is essential that you understand contraindications, warnings, precautions, and possible adverse reactions and carefully follow your eye care professional's directions and all labeling instructions for proper use and care of your contact lenses, lens case and lens care products.